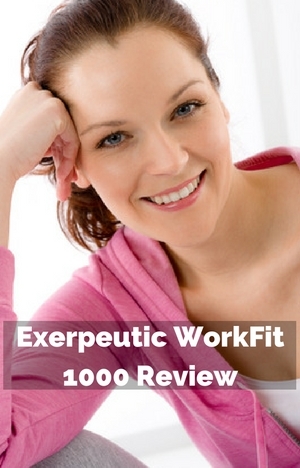 The Exerpeutic Workfit 1000 allows you to get fit while you work. Or while you play video games or watch TV. It has a desk that can fit a laptop and other media devices. While using those devices you can be pedaling at the intensity you want. It seems like a great timesaver to get fit and stay fit. We are told you need to add more activity into our lives to overcome the problems of a sedentary lifestyle. But can you really do that practically with this bike. In my review I look at how well it performs as an exercise bike and a desk and whether you can really combine the two to work on your fitness and make the most of your time. First thing to look at is how well it stays firm underneath you as you workout – no one wants a desk moving around while you try to work or play. Although it only weighs 64.7 lbs the bike is going to hold you steady without concerns of tipping over. The steel frame and stabilizer bars will keep it steady and there should be no problems of it moving around leaving you to exercise and concentrate on your work. The front stabilizer bar caps can be used to stop any rocking by turning them to level up the bike if the floor has some variation in it. The bike comes with a 3 year limited warranty which is fairly good for bikes in this price range. How the bike will stand up to long term use in the home is not known yet as it is recently released. Other bikes by Exerpeutic do have a good reputations overall for being well built and durable. Initial reviews are positive on the quality of the bike. The bike has a number of ways it can be adjusted to fit people comfortably and properly between the heights of 5 ft 1 ins and 6 ft 3 ins. You can adjust the desk position vertically, horizontally and the angle too. As well as that you can change the height of the seat and the horizontal position of the back rest. The adjustments to the desktop and seat height use adjustment knobs with pop-pins. You loosen the knob and pull to release the adjustment pole and slide them into position then re-engage pin and then tighten to hold in place. The desk top has 5 height positions between 41 ins and 45 ins from the floor. The seat height is angled which helps to move it away from the desk as it goes higher to give more room for taller people and vice versa for shorter people. The back rest is not something you’ll want to do too often – it does make it difficult if there is more than one of you who want to use the bike and are at different heights (you may need to compromise on the position somehow). You don’t usually get an option to do this at all – so it is good to see, it’s just a pity they made it so it’s not really practical to do it on a regular basis. It involves 2 bolts and nuts and a slider bar under the seat. There are 3 positions you can move it to accommodate people between 5ft 1 and 5 ft 3 ins, 5 4 ins and 5 ft 11 ins, and 6ft and 6ft 3 ins. You also have to disconnect and reconnect the hand pulse sensor wires. It would have been much better to use a pop-pin and adjustment knob – but at least they have done something about it. To get the desk at the right position for you it is possible to have it angled at 0 degrees, 15 degrees and 33 degrees using the adjustment knob at the side of the desk support pole. It’s quick to do so you can make changes as you go if you want to change as you go. Similarly to move desk backwards and forwards there is a knob under the desk to change the position as you want. The magnetic resistance levels are controlled by a tension knob that is in easy reach on the front support below the desk. It has the 8 levels marked on the knob so you can quickly see and set the level you want to exercise at. The increase in resistance is incremental and move smoothly between the levels. It starts off very easy and goes up to moderately hard. You can get up to moderate workout but not to a very challenging one, which is probably not too big a deal if you are using it to workout while working or playing a video game etc as it is more about getting the benefits of activity over just sitting there or exercising flat out (and is the same as other folding exercise bikes with desks. The magnetic resistance is very quiet and very low maintenance as there is no touching parts there is no need to replace pads or anything to make a noise. It has a V-belt drive and balanced flywheel that gives a good consistent pedaling motion. When you turn the resistance to 7 and 8 you may find that you notice a little pulsing as it slows down round the top/bottom of the pedaling due to the resistance having a braking effect. This is all enclosed to protect it from damage from dust and dirt as well as keep it out of reach of children and pets and your ankles too. The pedals are out in front of you and down at an angle rather than more below or out in front like you have on a recumbent exercise bike. It might take a little getting used to if you ride an outdoor bike. But most find it comfortable and easy on their joints and doesn’t put too much on different leg muscles. The pedals have a larger platform and adjustable straps to keep your feet from slipping while having a good platform to push against when you want to increase intensity. ~You may find the first time you adjust the straps it can be a bit tough but it does get easier and you don’t have to do it each time as you can just slide your feet onto the pedals. Seat. The seat is a large Airsoft pad that helps to distribute weight and allow a good flow of air through it to help you from heating up. To help further with balance there is a backrest. The backrest is angled and is a good size to support the whole of the back like a chair back although it is a little narrow for all across the back.. There is a bit of a gap between the seat and the backrest (in particular height) which some may find doesn’t give them the support they want even after adjusting for height as shown in manual. To help with this type of issue people use folded up towels or cushion and find that is all that is needed to give the support needed. Though the seat may be comfortable for most people (based on other bikes with this seat) some won’t like it – it is the same sort of seat that is on the Exerpeutic 1000 and most find it comfortable but not all 100%. Here again people who do have problems with it use cushions or folded up towels to get the comfort they require. Although they may not be sitting on it as long as you might want to when using it for work – but it may help to remind you to get a recovery break from time to time – as you are supposed to. Noise. The bike is going to operate very quietly so you can hear the TV easily while using it. Also, if you take a phone call it is unlikely that people on the other end will know you are exercising other than possibly your breathing. You can use it any time without disturbing others even when they’re sleeping except it they are very light sleepers. It also makes it a good choice if you want use it at work as it shouldn’t disturb your colleagues even in a very quiet office environment. Cleaning. The bike itself isn’t really going to generate much dirt. The biggest concern maybe sweat depending how hard you are going to push yourself on the bike. To keep it working well and looking good it is a good idea to wipe it down after each use. It is also common for sweat to drop on the floor which if you want to protect it from the effects of sweat you may want to put the bike on a rubber exercise mat. Handlebars. There are a set of handlebars that are level with the seat. They can provide support if you need it as you exercise or work. They are covered to make them a more comfortable grip and so your hand don’t slip if they get sweaty. At the end of them are the hand pulse sensors that you grip when wanting to monitor your heart rate. They shouldn’t get in the way while you are pedaling or getting on and off the bike. When you’ve finished using the bike you can fold it up and wheel it to where you want to store it. The bike does weigh 64.7 lbs. The 2 transport wheels take most of the weight leaving you to just move it to where you want it to go. It folds down to area of 21.3 by 25.5 ins so it can be put in a closet or behind a door out of the way. Before moving you need to fold the desk up, which is straightforward (although I think the instructions in the manual get this wrong it is easy to do). Once folded up and the safety pin has been re-inserted you lean it onto the wheels on the back stabilizer bar. The wheels will work on most surfaces but may stick on carpet sometimes due to the wheels being inset so they may jam and you may end up sliding it across the floor. If you want to move it across a wood floor I’d test it first to make sure you aren’t left with a long scratch or dent in it after moving the bike across it. The bike does come only partly completed with the frame and drive assembled. You are required to add the stabilizer bars, pedals, seat post, seat, back rest, handlebars and desk top. Everything fits together making the job easy to do. You should allow yourself an hour or 2 to finish it but some can do it quicker. The tools needed to complete it are included. The instructions and diagrams are clear. You might want the help of a second person to hold pieces in place but one person can do it, it just is more awkward in a few places (you feel like you need a third hand). It has a small basic console at the bottom of the desk. You can see it even when you have a laptop on the desk. To reset the measures except odometer you press the reset button for 4 seconds. It only shows one at a time which you can scroll through by using the mode button or you can set it to scan through them displaying each measure for 6 seconds at a time. It can help you see what you’ve done during the time you’ve been on the desk but you can’t upload it to a fitness app to keep a track of your activity over time. This needs to be done input manually. When you want to measure your heart rate you have to grip both hand pulse sensors in the handlebars. You won’t get a reading if you only have one hand on them, which does make it difficult to do this while you’re working unless you take a break from typing. Also these type of sensors can be unreliable with many not able to get them to work consistently or at all. If you want to monitor your heart rate I think you are better to get a heart rate strap and do this separately. To start the console you start pedaling. After 4 minutes of no pedlaing it turns off (although measures are stored so you can carry on from where you left off). It helps to keep the batteries from draining away to quickly. It takes 2 AAA batteries that included and are easily replaced when needed. You can still use the bike for exercise and adjust resistance even when batteries are dead. If you like to keep a record of your workouts and performance over time you are going to have to so this manually as it doesn’t work with a fitness App or allow you to upload to am account.. The display is not backlit so if you are using in poor light conditions it will be difficult to read. The Desktop is one of the main features of this bike. It is an integral part of this folding exercise bike. It comes with 2 drinks holders which aren’t that deep but will hold the cup in place, just not that great for putting pens in (there is a drawer underneath that you could put them in). The desktop size of 24 in (W) by 16 ins (one of the largest available) and weight capacity of 44 lbs provides plenty of room for 17 ins plus laptops with room for a mouse and smartphone on the desktop at the same time, giving plenty of work space, you might not have room to read or work on paper at the same time with larger lap tops. The laptop rests on the arm rest at the bottom edge of the desk. It doesn’t come with a strap or anything else to hold the laptop or media device on the desk. It is steady and you probably don’t need it but I’d add a strap to make doubly sure. Underneath the desk is a wide but shallow draw that is big enough to hold a tablet and other items (pens), a phone etc to keep them close at hand. You could probably have it open to have your papers near or a tablet going for even more multi-tasking if you want although you wouldn’t want to press down on it and the top half would be partly obscured by the desk. At present there are only a few reviews that have been left and to date they like the bike with all rating it a 4 or 5. (Although it is mixture of Vine and actual customers). Customers find it easy to assemble, it has a good size seat, its quiet so people won’t hear you exercising while you are on the phone and it has a large desk to fit a laptop, phone and mouse. The bike is priced in between the 2 most popular folding exercise bikes with a desktop. It provides more options to adjust for comfort and use than either of these bikes, making it good value for the money, especially as reviews seem to indicate this too. When I checked, Amazon it qualified for free shipping and Prime. The Exerpeutic 1000 Workfit has a number of very good features to allow you to work on your fitness as your work or play sitting down. It can help you overcome the effects of the lack of activity that our modern life seems to promote more and more. It’s not designed for elite athletes to push themselves, but you for everyone it can add activity and you can get your heart rate up and get a sweat up too if you want. Or you can take it easy with light resistance just turning the pedals over as you go. It has a good size desk which is big enough for a 17 ins and above laptop – there will be space for a mouse too. It has a good sized drawer to keep everything at hand and two cup holders so you can stay refreshed too. If you want to add more activity into your life this is a great way to do it by getting it done without having to give something up. It makes it a real time saver as well as space saver.